The T300si benefits from the same wireless technology as the Aspirante but features a sleek satin and chrome control panel. Being a wireless digital shower, the power pack and any unsightly plumbing are hidden in a loft or cupboard to suit whilst the sleek riser rail and handset and the beautiful elegance of the satin and chrome control panel are on show giving a minimalist look and feel to any bathroom. Available in 9.5 and 10.5kW. Q. Could the remote box be installed in the loft directly above the shower? Hi, the contemporary flush fitting satin control panel communicates with the remote power pack without using a cable. 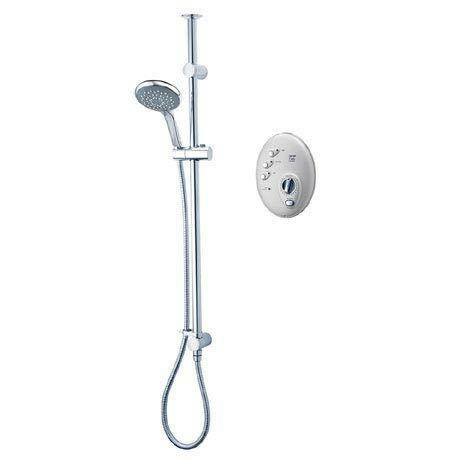 It can be situated wherever you wish, either in or outside the showering area. Hope this is some help! "Outstanding, works well as advertised." "Excellent product, would highly recommend, sleek and stylish."